Covering trends in research, instruction, and patron services within today's law libraries. 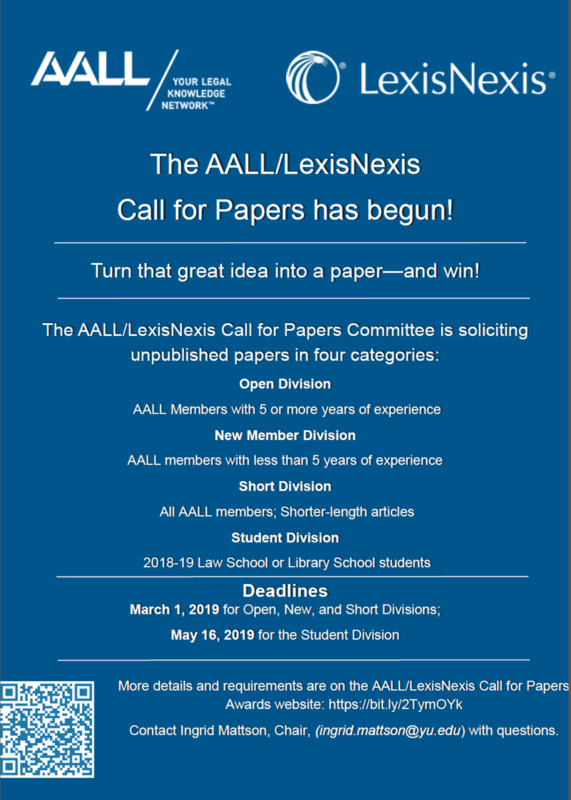 AALL/LexisNexis Call for Papers – Submit Today! Jamie Baker is the Interim Director of the Law Library at Texas Tech University School of Law. She also teaches Civil Trial Research & Academic Legal Writing, as well as sessions in the Legal Practice program and Excellence in Legal Research program. She blogs at www.gingerlawlibrarian.com. This entry was posted in AALL Annoucements. Bookmark the permalink. The RIPS Law Librarian Blog is published by the Research, Instruction, and Patron Services Special Interest Section (RIPS-SIS) of the American Association of Law Libraries. All opinions expressed in the posts herein are those of the individual author and do not represent the opinions of RIPS-SIS or AALL. Guest posts from RIPS-SIS members are encouraged; please contact the blog editor.